Had the torpedo nuclear-powered missile-carrying submarine, officially called “submarine cruiser” K-524 (in accordance with the NATO classification – assault submarine of “Victor-3” type) hit an iceberg or got stuck in that incredibly narrow straight between the ice and the ground where Captain V. Protopopov steered it, it would have become another “Flying Dutchman” of the Arctic Zone...But, fortunately, K-524 made it safely back home from that super-risky and highly dangerous cruise, which was precisely the reason why it was so soon forgotten and doomed to be labeled with the “top secret” stamp while the crew were forced to make a signed statement on non-disclosure despite the fact that the captain had been granted the Gold Star of Hero and the officers were decorated with orders. The decree on Government Award was also issued secretly. But it is better to have the press keep silence about you and live than to become the target of postmortem rumours and fame…By the way, the press did not keep silence. They tried their best to tell the story, at least using the Aesopian language. In 1986 I was sent by the “Pravda” military department on a business trip to the capital of the Northern atomic fleet, Western Litsa, with a commission to write about the captain of K-524 Vladimir Protopopov (on the photo). It was the most ridiculous, even absurd, task in all my live as a professional reporter: I was to write about this hero without even describing the deed he had performed. The whole report was reduced to general phrases about their under-ice voyage as if atomic submarines were undertaking their exhausting voyages to high latitudes only to search for water openings or ice-holes and break the ice. The article about Protopopov and his crew was called simply "Those raising the ice". The war in Afghanistan was in full swing - it was a hot, very hot war. Along with that, there was a war in the ocean –it was a “cold”, very “cold war”. It was a war of deterrence, of intimidation aimed at gaining parity and equilibrium between the adversarial nuclear powers. Historically, it happened so that the Russian, later the Soviet, and now again the Russian Fleet have had the most geographically disadvantageous and unfavorable deployment conditions. All the outlets from the Black and the Baltic Seas have always been under control of the NATO Naval Forces. The access to the Pacific Ocean is naturally blocked by the chains of different islands such as Kurile Islands and Japanese Islands, and the straits between them, in case of launching military operations, can be easily and quickly mined. It is only from Kamchatka that the access to the ocean is unhindered, but how far the Kamchatka Naval base is from the main sea battle-grounds! The struggle for gaining control over the secret outlet to the Atlantic lasted for many years. One fails to mention all the cunning devices, tricks and ruses of war which our commanders and captains resorted to. 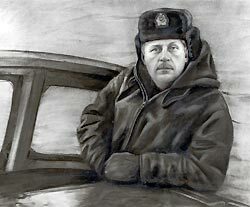 Soon Admiral V. Chernavin, the Commander-in-Chief of the Northern Fleet charged Captain Vladimir Protopopov with an important mission to discover a brand-new trail to the North Atlantic – avoiding all the anti-submarine barriers – round Greenland, through the labyrinths of the ice-bound polar archipelagoes. It was not accidental that the choice of the Commander-in-Chief fell on the submarine K-524. Everyone in its crew was a real professional with a highly-developed team-spirit, and the K-524 crew was considered the best. Rear-Admiral Anatoliy Shevchenko (on the photo) was appointed the senior aboard. Young, energetic and daring, he was a perfect companion to cautious, prudent and unhurried Protopopov, actually, they supplemented each other in the best possible way. — I myself steered the submarine in our underwater navigations many times. But, it seems to me, never before was I so nervous and worried than that day in 1986 when I saw off the atomic submarine K-524 under the command of Captain Vladimir Protopopov. It was not that I did not trust this experienced captain, quite the contrary. But he was to undertake the longest and the most difficult voyage under the ice vault of our planet. I was close to saying “flight” because an under-ice cruise resembles very much a plane flight above the sea where, as you may know, there are no alternate aerodromes available. So, a submarine can float to the surface only if there is a proper “aquadrome”, i.e., ice-hole. Among the brave and courageous tribes of seamen, there appeared a unique caste of people in the Arctic – so-called ice captains. These are those individuals who, beginning from the times of “Ermak”, “Vaigach” and “Taimyr”, have been steering their vessels through the ice-bound territories not just sailing but cleaving through and crashing the frozen waters. The “under-ice captains” enriched the honorary cohort of explorers of the northern waters. They not only submerged into water but they went down under the ice. This means that the degree of risk doubled together with the responsibility. Isn’t it natural to say that the Arctic submariners are twice seamen, twice masculine, courageous and brave?! Arctic voyage itself is extremely dangerous and risky; while the underwater voyage with a nuclear weapon on board is even more risky and challenging. With submerging under the ice, the crews of submarines put their strengths and fate to the test many times because in case of emergency they can not just float to the surface – what they have to do first is to find an ice-hole or break through the solid ice armour with a help of special anti-ice torpedoes. - We embarked on our mission amidst the greatest secrecy and conspiracy. It is only at sea after unsealing the special package that we found out where and for what purpose we were going. For the first time in the world’s navigation history we went through the straits of Franz Josef Land under water and ice. After that we headed for Greenland. We passed around the front line of the NATO anti-submarine forces and moved towards this narrow and rather shallow strait that was blocked with solid pack-ice. Our sea-chart did not provide any accurate measurements because no one had ever navigated here before us. We moved forward relying only on the newspaper, as seamen usually say in such cases, rather than on the sea-chart provided. The space between the ground and the lower ice edge gradually become narrower…Sometimes it seemed to us that the submarine would be gripped in vice of the Arctic ice not even being able to turn. There was to way back for K-524, we had to move only forward no matter what awaited us ahead. But even after they had managed to squeeze through this slit between the icebergs of Greenland and Elsmir Island, to go 300 miles through the strait under the ice, even when the waves of the Baffin Sea had become splashing into the deckhouse, the crew could not breathe with relief because one fatal danger was replaced by another – icebergs! Having slipped down from the Greenland glaciers, the solid blocks of ice had a sinking of approximately half-kilometer. It was impossible to dive under them. Captain Vladimir Protopopov: — Actually, there was not any safe depth in the Baffin Sea for us due to the icebergs which were in abundance. We had to locate them with a help of the deep-water sonars, which operated in a mine-detector mode, and avoid them following the reports presented by our acousticians. Just like in the famous film “The Mystery of the two Oceans”, remember? …I have remembered this film from my childhood. But for that underwater vessel, invented by a writer-fantast in early 1930th, it was much easier because it was capable of burning the ice with a heat ray, thus clearing its way. Whereas Protopopov’s atomic submarine was armed with only ultrasonic signals to sound out its way. - The report presented by the submarine K-524 concerning the fact that they successfully fulfilled their mission on deployment in the Atlantic Ocean was received on time, and was welcomed with elation and enthusiasm at the Command Center of the atomic submarines fleet and flotilla. Active service under the Arctic ice of the atomic submarine K-524 was approximately 27 nautical days, it also made a forced crossing of the Nerce Strait. - In the end, we made our way to the Atlantic Ocean and, as if to reward us for this exhausting voyage, a very prestigious target – assault atomic aircraft-carrier “America” – was going by us on its way to the base. We attacked it secretly without revealing ourselves but, of course, only hypothetically. And we returned home unnoticed. - In the end of August 1985, atomic submarine K-524 undertook the world’s first under-ice voyage between Elsmir Island and Greenland (through the Nerce Strait, Smith Strait and then to the Baffin Sea and Davis Strait). It was a very significant event in the history of the Russian underwater fleet. 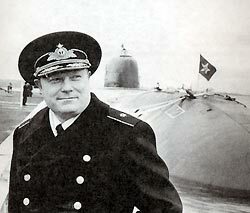 The Fleet Naval Council recommended the division commander Captain A. Shevchenko and the submarine captain V. Protopopov for the honorary title of Hero of the Soviet Union, while the members of the crew were to be decorated with the Government medals. 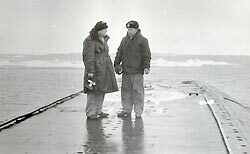 However, following the Decree of 19 February, 1986, issued by the Presidium of the Supreme Soviet of the USSR, the title of Hero was given only to Captain Vladimir Protopopov, while A. Shevchenko was conferred the military rank of Rear-Admiral. Source of information: stoletie.ru, Author: Nikolay Cherkashin.